This is a quick drawing that took around 15 minutes to do. 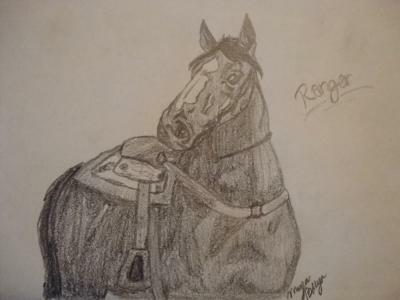 It is a drawing of Ranger, a horse i used to ride for riding lessons. Sorry if it isn't very good, i drew it off a picture with me on him so the saddle looks preety terrible. It’s not bad. It is AMAZING! WOW! That's so realistic! I love it! It looks exactly like a horse! I think the saddle looks great, better than I have ever done! *CRI* I can draw, You're so good! You should get a YouTube channel and do how-to-draw videos! You are amazing at drawing! That is a great picture! I love the detail. wow that is pretty good! I can't even shade in that well! You did so well! Great picture!! I can't shade that good in 15 minutes otherwise its really easy. Am I right? Wow! You are amazing at drawing horses. That is a very cool pic, who drew that? Soo awesome!!! i absolutely love this drawing. is it a photo or a drawing? Omg! That's way better than what I could draw! I love western riding! It is so epic! I love this website, I come on it very little though. Whoever drew this, keep up the good work! Wow, great pic! The shading is awesome! Keep up the great work! your drawing is awesome! I love the detail and value in your art! OMG, i ride at a barn that has a horse named ranger, he is a grullo. 1 sock on his left hind foot. But i don't think it's the same horse you drew.. i think..
so i want to be able to draw that well. i love horses but i can't draw that well. It's amazing! I wish I could draw like that. IT WAS THE BEST HORSE PICTURE!!! The best of them all..
Oh my goodness, so whoever posted that they think that they are a better drawer sure was rude! Hi, I'm karah, and I love to draw horses! I mean it's so easy to draw something you love, right? I do love my family & other people, but i'm not good @ drawing people. THAT DOES NOT MEAN THAT I DON'T LOVE CERTAIN PEOPLE!!! Anyways, you did great on our drawing! Keep up the good work! you are very good. that's what one of my horses look like. keep up the good work. Wonderful drawing. You are very talented. OMG THIS DRAWING IS SOOOOO FANTASTIC!!!!!!!!!!!!!! Hey my name is Anonymous and i would love if you could draw a horse jumping but i could easily draw something like that well almost, anyway horses are a big part of my life and i have my horse named Brindy. This So Looks Like Joey From War Horse. your drawing is amazing. i can't believe that you think it's bad i mean when i once tried to draw a horse it turned out to be a dog. the last time i tried to draw a horse.... well it turned into a dinosaur lol! wow! how did you do the shading? it looks incredible! keep up the good work! I couldn't even draw like that. Your drawing is super awesome! Don't worry about the saddle, I'm not very good at drawing them, either. But they're kinda hard, so you did really well on it! can you draw a mustang! because i think i am better. I couldn't draw that good on my life! You think that's not good!!! OMG! Are you nuts or something?! I couldn't draw a saddle as good as yours even if I was staring at one! Well, maybe that's a bit of a lie, but still! I really wish I could draw like that! That's really cool! It actually looks like a real horse...a photo of a horse I mean. 10/10! the drawings are great. I wish i could draw that good. wow! very good, u ride western! You are very talented. You can draw better then me!